Mecca Coupon is a printable coupon found on WebSaver.ca’s website. Visit WebSaver, select the coupon and click on ‘Get my Coupons’. You will be prompted to sign in or create an account. After you create your account, print off your coupon and bring it into your local drugstore or Walmart where you can claim your savings. 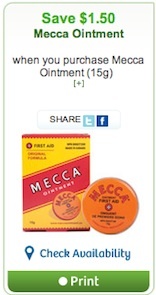 This is a Mecca coupon to Save $1.50 when you purchase Mecca Ointment (15g). Mecca Coupon is valid only in Canada, but excludes Quebec. You can find Mecca Ointments in any drugstore, Shoppers drugmart, Rexall, Walmart, Loblaws and more. 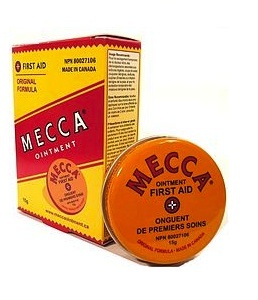 Mecca Ointment’s 3 way healing formula provides a protective barrier that keeps a wound moist while it heals, relieves the pain associated with minor cuts scripts and burns, and also soothes itchy insect bites, poison ivy and minor skin irritations.